Family Dining for the Big Game. Only on the East-side can you find amazing food in a restaurant with plenty of room for you and the family to spread out. Game-changing menu items like our Game Changer Bloody Mary--the Best in Bend! Challenging the Notion of Sports Dining. Who says you can't have stromboli and a Pats game too? Turning the word "bar food" into a good thing. 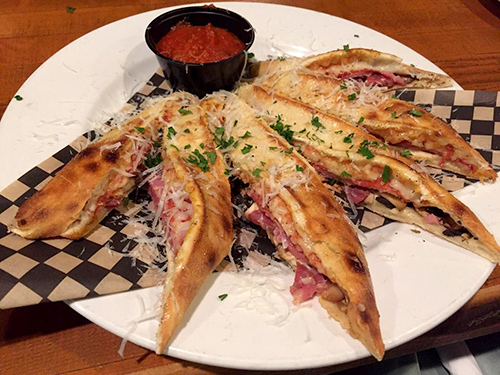 Man-sized, mouth-watering portion sizes and hand-tossed artisan pizzas. West-side Taste Without the West-side Wait. Brought to you by the creatives of the Victorian Cafe, it's a whole new concept in sports dining. The Hideaway. Where "The Food Network" Meets "ESPN". Better Food. Better Sports. Better Times. 10 big screens. 18 taps (2 on nitro). 6 couches. Endless food combinations. where Food Network meets ESPN! Famous for its world class breweries and amazing nightlife, it's easy to forget that Bend Oregon is a city of just over 80,000 in population. It's also among the favorite vacation destination cities for America's young, well-to-do families. With all it has going on, like Mt Bachelor's famous wintertime powder and a downtown scene that would rival any big city, it's easy to get caught up in, well, being caught up! The Hideaway Tavern is well-worth the search! 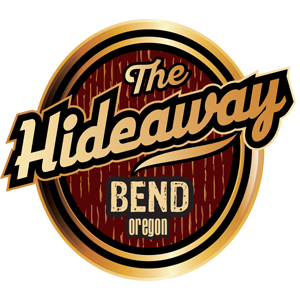 Whether you are looking for a local sports bar filled with like-minded sports fans, searching for an inspired breakfast menu with Bend's best Bloody Mary, or simply desire an lunch destination with a casual, kid-friendly approach, the Hideaway restaurant checks all these boxes. Sit comfortably in one of our many leather sofas and turn your attention towards our eight flat screen tv's while chomping down on some progressive dishes like our Curried Pork Wings. Whatever you do, you are guaranteed a good time at the Hideaway Tavern. If delicious restaurant food is what you desire, then leave it up to are creative culinary team, with culinary influences inspired by the Hideaway Tavern's sister restaurant, The Victorian Cafe! We have weekly specials and a full breakfast menu Saturday and Sunday that will challenge your taste buds with unique combinations inspired by fresh ingredients. We call it: progressive sports bar fusion! Sign Me Up For Your Sister Restaurants, Too! "great staff, stealhead dip and buffalo hot wings are to die for." ""We go because the bartender Patrick. He's a good bartender, and his recommendations never fail to impress. The food here is satisfying, and the choice of beer abundant. Highly recommend." "I love that we can take the kids and watch the Ducks play on comfy couches. We get to feel like actual adults in a restaurant, and because it's the owner of the Victorian Cafe, we can rely on unique and interesting specials. I recommend the pizzas. " "Great food great people <3 this place"